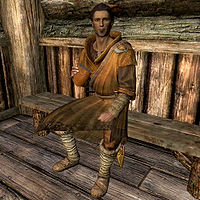 Marcurio, an Imperial destruction mage, is a sellsword and potential follower found within the Bee and Barb in Riften. You can choose to hire him as a follower for 500 gold. Marcurio is the only hireling available in the base game who will use Destruction magic against enemies. He will also use magical staves. Marcurio wears adept robes of Destruction and a pair of boots, and he carries an unenchanted dagger, the level of which is determined the first time you enter the Bee and Barb. Being a wizard, he knows a good amount of spells, namely, Stoneflesh, Chain Lightning, Firebolt, Lightning Bolt, Close Wounds, Fast Healing, Steadfast Ward, and Turn Undead. After hiring Marcurio as a follower, it is possible to marry him. Once married, he can continue to act as a follower for free. He does not have a house of his own, so choosing to live in his place instead of an owned home would mean hanging out in the Bee and Barb in Riften. Marcurio can also be recruited to join the Blades. "My skill in battle is unmatched. Fortunately for you, that skill can be bought." "Why hire a common soldier to protect you when you can have a master of the arcane?" "The only thing better than a powerful mage fighting at your side is... well, nothing, really." "For a modest fee, I'll bring my formidable arcane powers to bear against your foes. What do you say?" "Well, look what the horker dragged in. Still wandering all over Skyrim and causing trouble?" "I knew you couldn't stay away. Admit it, you were lost without me." When you talk, you can either decline his services, to which he'll say, "If you change your mind, seek me out here." or hire him, to which he'll say, "With a master of magic at your side, you'll have nothing to fear." If you hired Marcurio recently but then dismissed him, he will say, "Since you paid my fee recently, I suppose it's only fair that I join you once more." Once you agree, he'll say, "Once more into danger!" If you don't hire Marcurio, upon exiting the conversation, he will always say, "Why settle for just stabbing your foes when you can roast them alive in a gout of arcane fire?" Follow me. "Try not to walk into any spike-filled pits or filthy skeever dens." Wait here. "Don't make me wait too long. I get bored very easily." I need you to do something. "All right. What is it?" I need to trade some things with you. "I am an apprentice wizard, not a pack mule! Oh very well, but make it quick." It's time for us to part ways. "So you think you can make it on your own then. We'll see about that." Cave "Take extra care you don't hit your head on a low-hanging bit of stone." "Mind your step. I think I spied a patch of ice on the floor." "Don't go stopping for a nap. If you fall asleep in this place, you'll never wake up." "Are you sure you can find your way? It would be easy to get lost in here." Mine "Are you sure you wouldn't rather explore, say, a nice tavern?" "Let's try not to make too much noise. I've heard that cave-ins can start that way." "I wonder what they were mining down here." "Let's hope the miners didn't unearth anything besides precious stones, if you take my meaning." Nordic Ruin "If these ruins frighten you, take comfort in the knowledge that I am here." "Do try not to set off any traps, will you?" "I suppose you intend to carry off every item of value in these ruins." "These ruins might be interesting if I wasn't already an expert on Nordic history." Dwarven Ruin "Had they placed their faith in magic instead of machinery, the Dwemer might still be around." "A living Dwemer was once discovered in Morrowind. Can you imagine it, being the last surviving member of your race?" "I should bring some of these Dwemer artifacts to the Arcane University in Cyrodiil for study." "I wonder what keeps these machines working so long after their masters disappeared." "I would find the Dwemers' mechanical guardians fascinating if they didn't try to kill everything on sight." Military Fort "This smell of dank earth and worm-eaten wood is going to make me lose my last meal." "How pathetic, being forced to eke out a miserable existence in a place like this." "Just look at this place. Is this what passes for a fort in Skyrim?" "The sooner we can get out of this filth-pit, the better." Bandit Camp "Bandits are desperate men. They have nothing to lose, and they fight like it." Warlock Lair "What some call devotion to the dark arts, I call foolishness." Forsworn Camp "These Forsworn don't even have the decency to dress right." Draugr Crypt "Draugr are slow and clumsy. Hardly a challenge for a man like me." If Marcurio is the target of The Fishing Job, it will be very difficult to sneak up to him and pickpocket, so instead, you may hire him as a follower and then trade items with him, taking the amulet, and completing the quest for Delvin. If you wish to avoid the hiring fee, using the invisibility spell or potions will make pickpocketing possible. It is also possible to use regular sneak mode if you attempt the pickpocket at just the right angle and during hours when there are very few patrons in the tavern. Because of the radiant AI system, the game may potentially lock out the option of marriage with him even if all quest/hire/other requirements have been satisfied. ? Marcurio may partially take a weird aspect of a Werewolf after you switch any of his armor/apparel. He will keep acting and talking normally and will even wield weapons, though (confirmed on PS3, patch 1.9.31.0.8). ? This page was last modified on 27 October 2015, at 03:41.